Star clusters are groups of stars close to each other in space that appear to have roughly similar characteristics and, therefore, a common origin. Some of the over 100 billion stars in the Milky Way, our home galaxy, are grouped together in either tight or loose star clusters. More than 100 tight groupings, called globular clusters, surround the galaxy's spiral arms in a great halo. Loose groupings, called open clusters or galactic clusters, are far more numerous and are found toward the center of the galaxy. Globular clusters radiate with a continuous glow. These nearly spherical (ball-shaped) star systems contain anywhere from tens of thousands to one million stars. They are most heavily concentrated at the center of the cluster. While in reality there is a great distance between stars in these clusters, an observer on Earth may find it impossible to pick out individual stars. In contrast to globular clusters, which are 10 to 13 billion years old, open clusters are quite young. These groups, formed just a few million to a few billion years ago, contain hot young stars and some stars still in formation. Open clusters have far fewer members than globular clusters (usually just a few hundred) and have no particular shape. Over 1,000 open clusters have been identified in our galaxy. However, many more may be undetected because of interstellar matter that blocks our view of the Milky Way's plane. 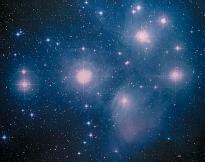 One the most famous of the open clusters is the Pleiades (pronounced PLEE-a-deez), or the Seven Sisters. This grouping in the Taurus constellation consists of six or seven stars visible to the naked eye, but many more when viewed through a telescope. Cluster of galaxies: A group of galaxies that are bound together by gravity. Globular cluster: A tight cluster of tens of thousands to one million very old stars. Light-year: The distance light travels in one year in the vacuum of space—roughly 5.9 trillion miles (9.5 trillion kilometers). Open cluster: A loose cluster of roughly a few hundred young stars. Supercluster: A connected group of clusters of galaxies that may extend for hundreds of millions of light-years. Void: Region of space extending for hundreds of millions of light-years that contains few if any galaxies. Superclusters are currently the largest structures known in the universe. As stars and clusters of stars group together into galaxies, galaxies collect into groups known as clusters of galaxies. On a larger scale, superclusters are clusters of clusters of galaxies. As clusters of galaxies group into superclusters they leave empty spaces called voids between the superclusters. Superclusters and voids typically extend for hundreds of millions of light-years. Star clusters are certainly not limited to the Milky Way galaxy. In 1924, U.S. astronomer Edwin Hubble identified globular clusters in what, at the time, were believed to be nebula (clouds of dust particles and hydrogen gas) within the Milky Way. He discovered that the distance from Earth to these globulars, and the nebula in which they were located, was so great that these globulars had to be entirely separate galaxies. Thus, Hubble proved that the Milky Way was not the only galaxy in the universe. it would be interesting to know what the distances are between the individual members of the M45 Pleiades cluster. If you're on a planet circling a star in the Pleiades cluster it seems a good question to ask what their night sky looks like and what does our Sun look like or is it too small to be seen.